We arrived at my parents' a couple of days before we left for the beach. As I have mentioned before, they live in a rural area surrounded by farmland. One of the perks is having easy access to fruit and vegetables. 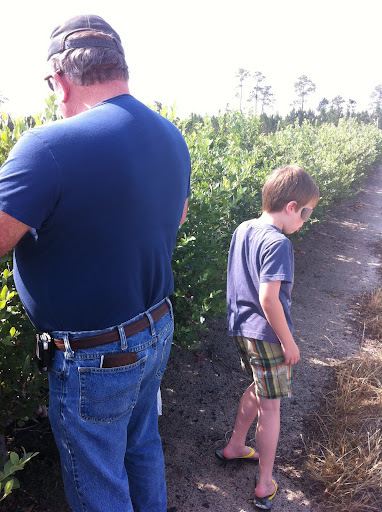 Just up the road from their house is a large blueberry farm and the guy that owns it lets them come and pick all the blueberries they want for free. 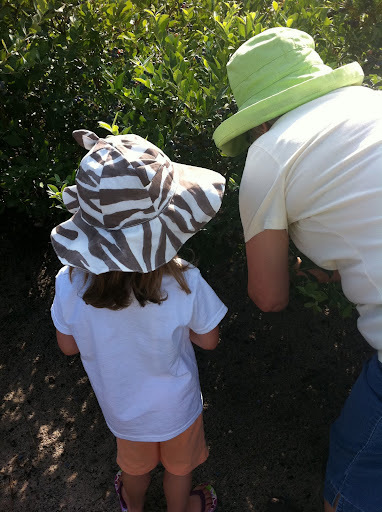 We went one morning and ate blueberries right from the bushes (pesticide-free). Pure bliss. I hate to think of how many I ate! Actually, I don't hate too think of it because I was in heaven! We also had several bags to take with us. There were blueberries as far as the eye can see. It was glorious. He also had corn as far as you could see in the opposite direction. I think corn is one of the most beautiful crops. I love to see the tops swishing in the wind. There are peanuts planted on my family's land. One of my all-time favorite scents is that of "peanut dirt." For real, when you pull up peanuts from the ground the smell is intoxicating. I know it is just dirt, but it is amazing. I love where I grew up. I love going home and soaking up all the things I took for granted as a child. Being surrounded by farmland is grounding. And I love the community that is woven through that farmland. It seems that every couple of days, my parents find a bag or box of fresh produce at their back door. Even when we returned from the beach, there was a basket of corn in the back of my daddy's truck. I love how everyone provides for each other while asking for nothing in return. That is community. This is beautiful. I'm so over the city. I want to be able to throw the front door open and let my kids run free. How awesome. I've been wanting to learn more about growing/where I can find peanuts outside of the store. I read a blog post on making your own pb so I've been wanting to give it a try. Quite jealous of your blueberry adventure! John bought us one little bush with berries already on it. It was looking great! Then we came back from the beach and something(s) at all the almost ripe berries off. Boo! Is your family in North Carolina? I don't know if you figured it out from my blog but I am in NC, in Kinston. Where abouts are y'all? Had a great time in the field! Am ready for yall to come back and pull peanuts!